Welcome to the sixth annual Best Advertising Billboard Awards (conveniently also known as the BABs), announced slightly later this year, but no less fabulous. 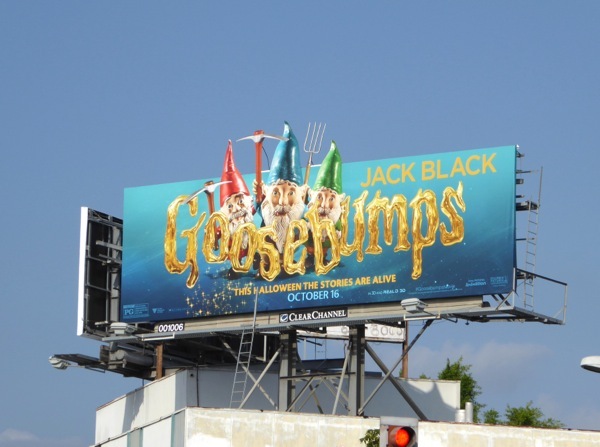 Every year Daily Billboard tries to cherry-pick the most eye-catching, engaging and inventive billboard designs, gimmicks and ad creatives that have really stood out and turned heads in the streets and skies of Los Angeles for the past twelve months in the worlds of TV, film, fashion, drinks and more lifestyle brands besides. Let's get to it and announce 2015's lucky winners. Even though the movie may not have been an enormous success at the box office last Summer, Pixels The Movie still had some impressive marketing to help generate interest in the nostalgic video game big screen comedy. 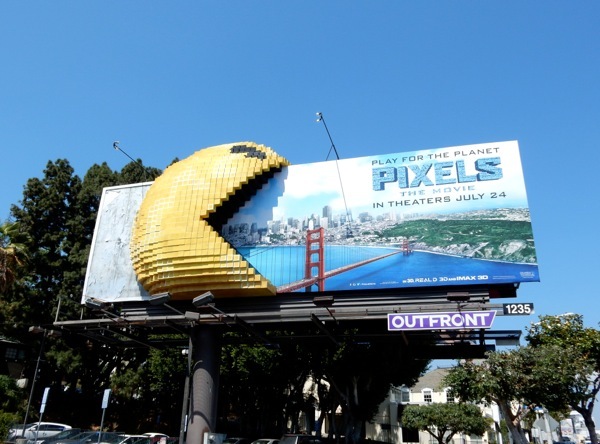 This 3D pixelated Pac-Man cleverly devouring a billboard hoarding (and the city of San Francisco) was a real attention-grabber along the Sunset Strip and Santa Monica Boulevard, and was just part of a broader campaign featuring more classic video game characters. 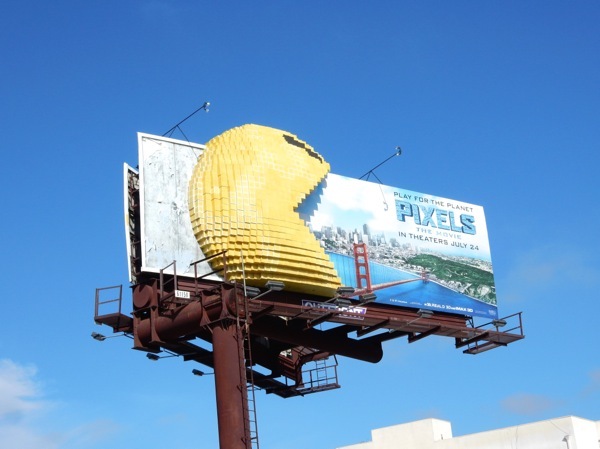 If you like the look of this 3D installation, be sure to check out more examples in Pixels The Movie's billboard campaign. Other special builds and installations under consideration for the BAB Award this year included SpongeBob's bubble-blowing billboard, Minions Cinerama Dome character inflatables, Crazy Ex-Girlfriend's 3D balloon heart billboard and Red Nose Day's special Statue of Liberty billboard. 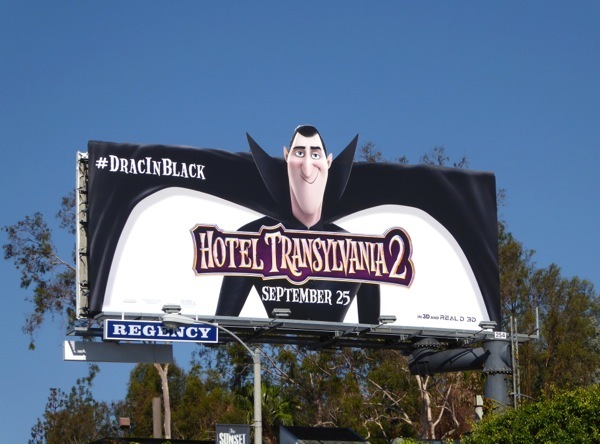 This year's recipient of the Best Movie Billboard Award is the animated sequel, Hotel Transylvania 2, which had an assortment of monster character special extension billboards filling the L.A. skyline in advance of the movie's release. Not only was the campaign focused, vibrant and fun-for-all-ages, but it also got people in the mood for Halloween with all the vampires, mummies and classic creatures. 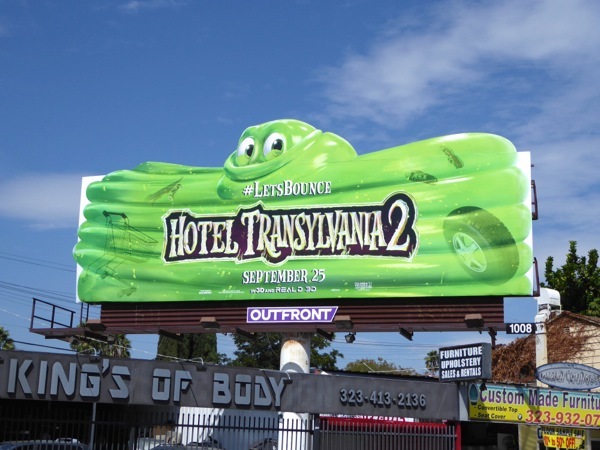 The Blob 'Let's bounce' and Frankenstein 'Heads up' creatives really made Daily Billboard go "wow" when seen for the first time. 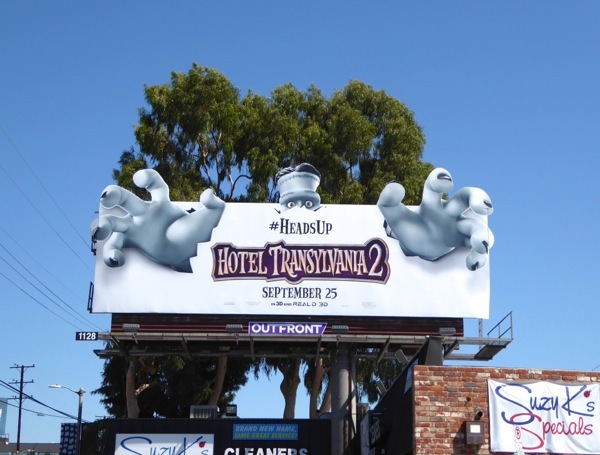 If you like these monstrous examples, be sure to check out even more Hotel Transylvania 2 movie billboards from around L.A. last September. 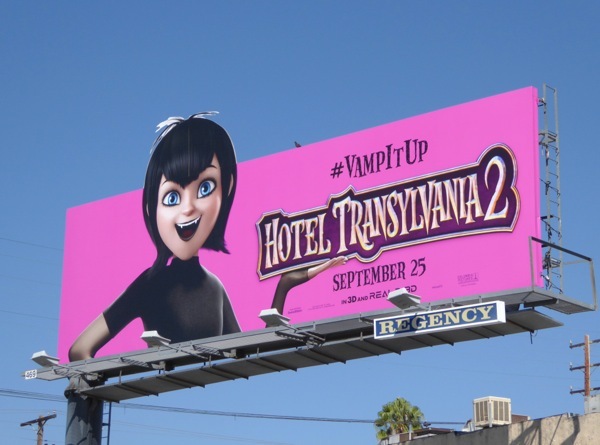 Alternative campaigns in the running for this award were these Mad Max: Fury Road movie billboards, Ant-Man's super-sized light switch billboard, these tongue-in-cheek Spy movie billboards and of course, the Minions outdoor ad campaign. 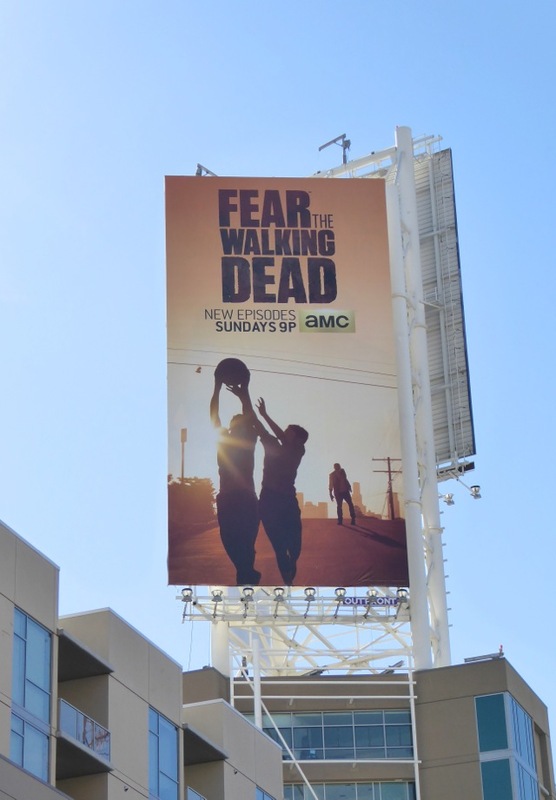 In the world of TV, the key art for spin-off companion series Fear the Walking Dead instantly captured the spirit of AMC's hit parent show, The Walking Dead, and immediately conveyed the dawn of the zombie apocalypse and the demise of civilisation in the City of Angels in a classy way. Other favourites from TV land worthy of mention were the season three billboards for The Americans, Veep's season four Mount Rushmore parody billboards, House of Cards season three billboards and the Emmy outdoor ad campaign for Transparent's first season. 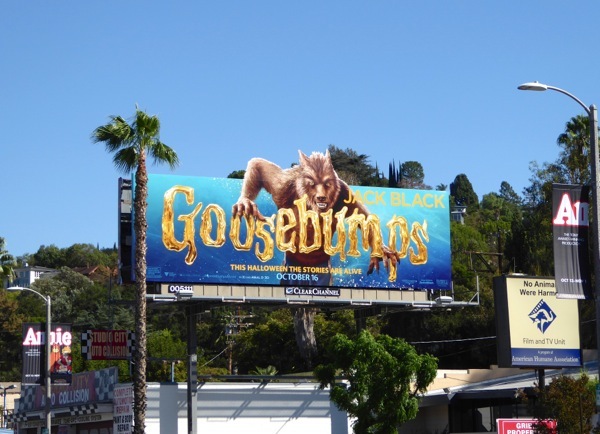 Some may say that these Goosebumps special extension billboards are a bit similar to the Hotel Transylvania 2 ads, and we'd agree, but we'd also say that they are slightly more sinister and deliver an unexpected assortment of visuals, from werewolves to lawn gnomes, and creepy ventriloquist dummies ripped from the pages of R. L. Stine's books. 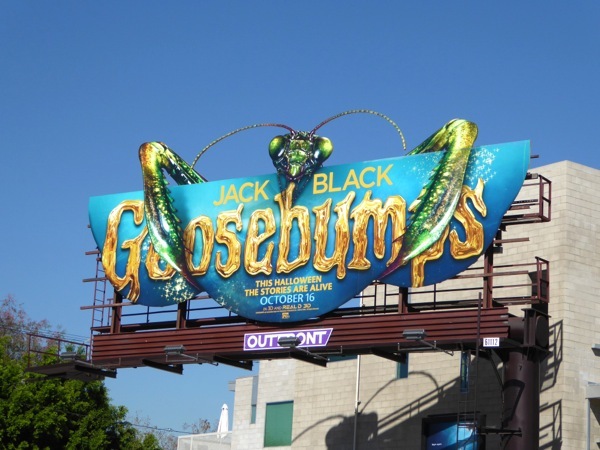 In addition, the giant praying mantis creative with its chewed edges, plays around with the conventions of the billboard hoarding, which always helps to attract more attention. 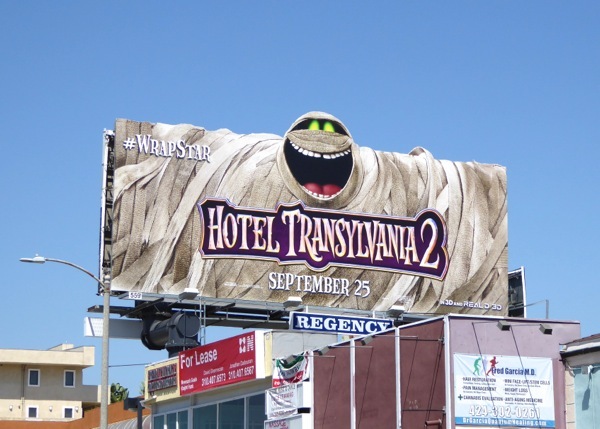 These eye-catching outdoor ads did a great job of raising the profile and awareness of a nostalgic book-to-movie adaptation property that no one was particularly demanding. 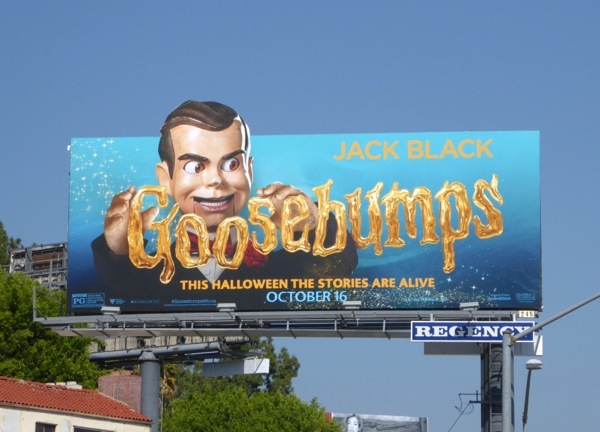 Be sure to also check out the rest of the Goosebumps movie billboards that terrorized the city skyline before Halloween. 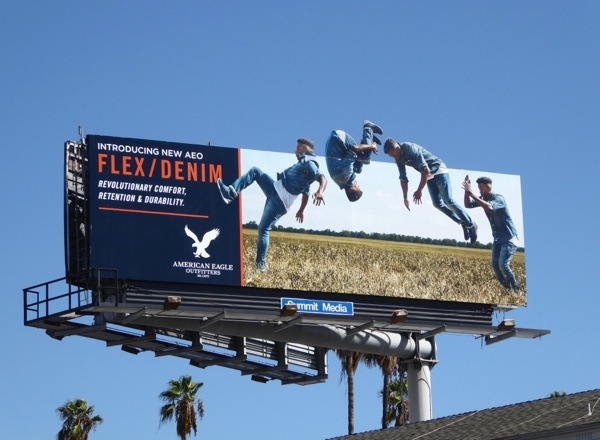 Runners-up in this category include this Kingsman: The Secret Service Gazelle billboard, the Fallout 4 video game billboard and AEO's Flex/Denim fashion billboard featured below. 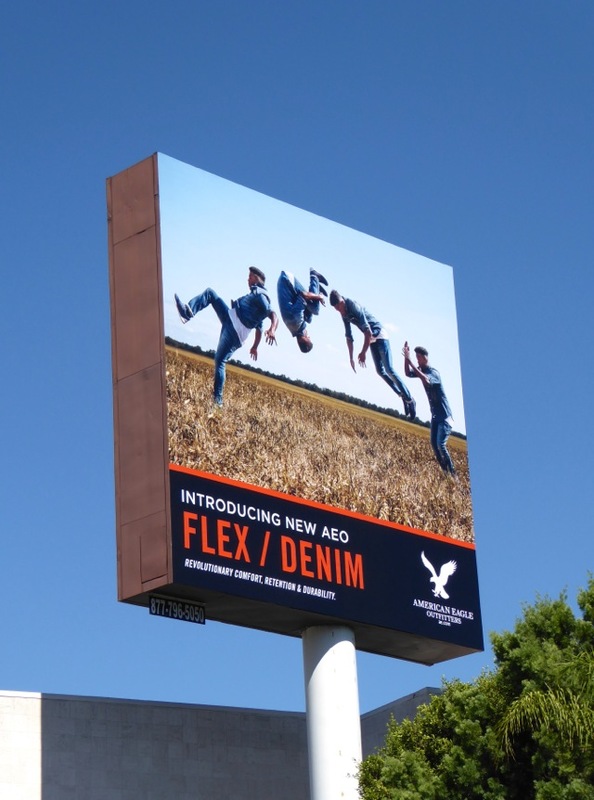 The fashion out-of-home campaign that really stood out for Daily Billboard in 2015 were American Eagle Outfitters dynamic Flex/Denim billboards. 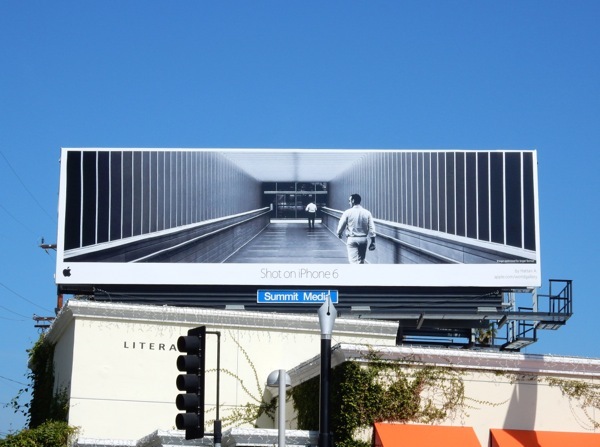 The striking, youthful ad creative, which really conveyed the movement of the clothing, worked in standard, special extension and super-sized formats in key locations around L.A. and New York City. 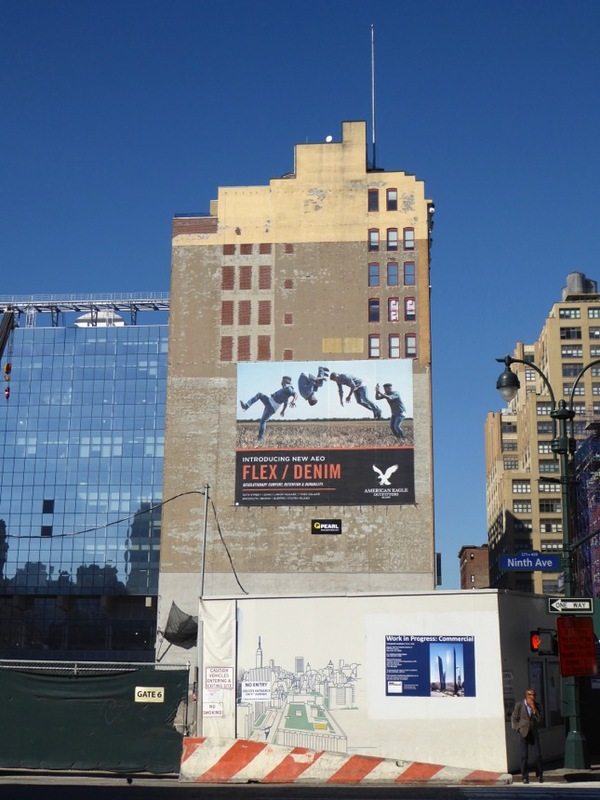 Other contenders from the world of fashion included Oakley's sports apparel One Obsession ad campaign and this special extension billboard for Perry Ellis back in Spring 2015. 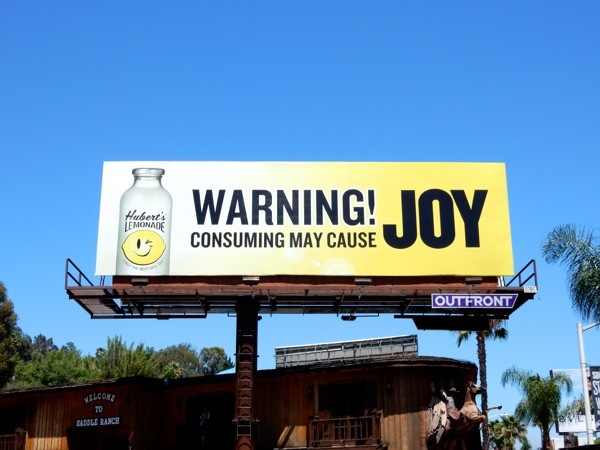 The beverage brand bringing a ray of sunlight and pure joy to the skies of L.A.'s Sunset Strip this Summer was Hubert's Lemonade with this simple, yet attention-grabbing ad creative. This zesty billboard was certainly designed to catch your eye and lift spirits, and is the worthy recipient of 2015's Best Drinks BAB Award. 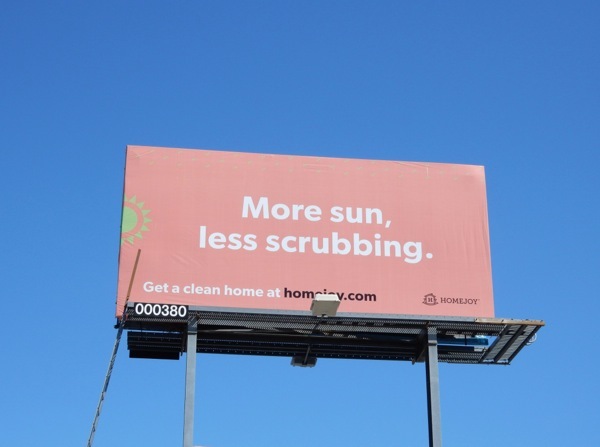 The other notable billboards in this category include Vitamin Water's colourful Hydrate the Hustle ad campaign and Corona Extra's new can billboards. 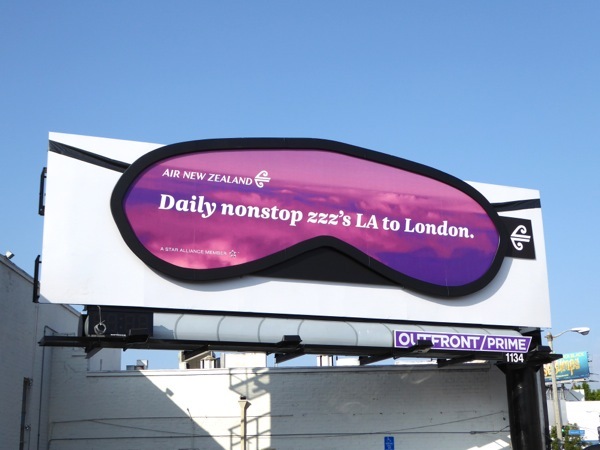 Shaking things up in the world of travel, to promote their new daily nonstop service to London from L.A., Air New Zealand got inventive and had this unconventional and eye-catching sleep mask grace L.A.'s busy Beverly Boulevard, custom-built by Atomic Props & Effects, in October 2015. 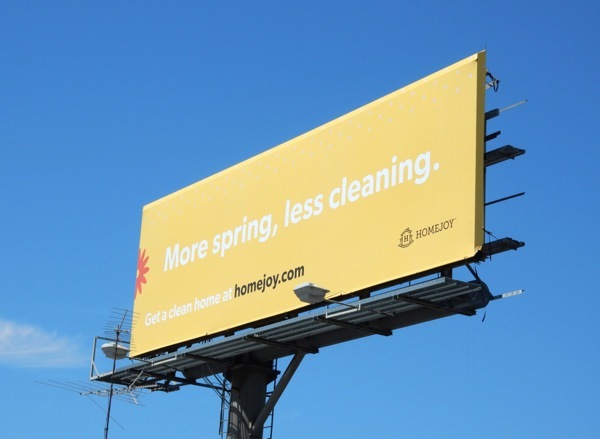 Other ad campaigns which stood out in this travel and tourism category included The Getty Villa's recent billboards and the Natural History Museum L.A.'s A New Way to Museum billboards. 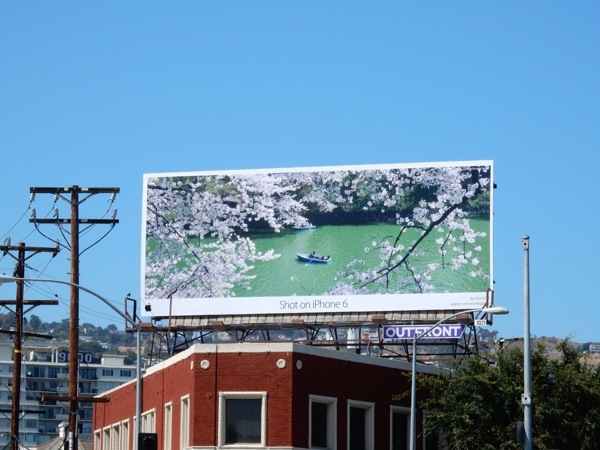 One of the most unexpected and visually stunning outdoor ad campaigns of the year was provided by Apple and their 'Shot on iPhone 6 World Gallery' billboard series. These user-generated images from all over the world would convince anyone that an iPhone 6 smartphone can take beautiful, professional looking pictures. 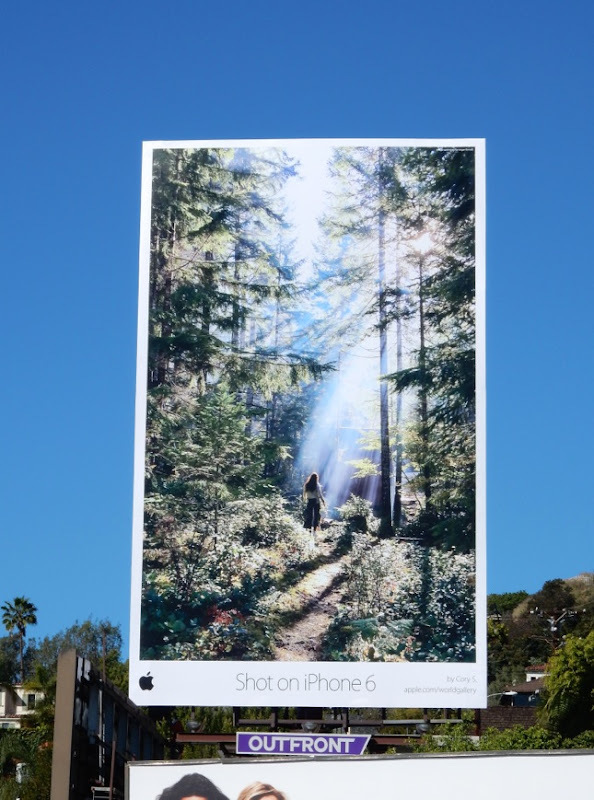 This global ad campaign debuted in March 2015 and really filled the skies with amazing, engaging and breathtaking imagery, with a whole host of creatives refreshing every few months and constantly providing photographic inspiration (and a reason to buy the iPhone 6). 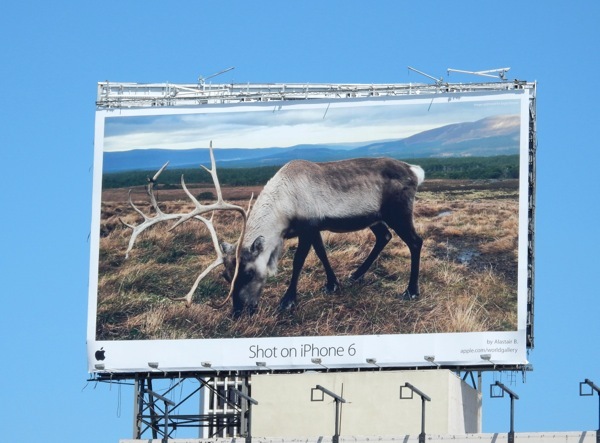 If you like this small selection of arresting ads, be sure to enjoy more of Apple's Shot on iPhone 6 billboards. 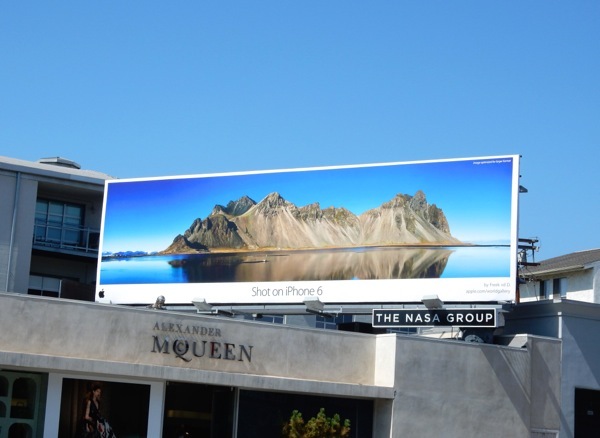 Another consumer technology advertising campaign that impressed in 2015 were these Nest Cam billboards and of course later in the year, Apple TV's outdoor ad campaign. 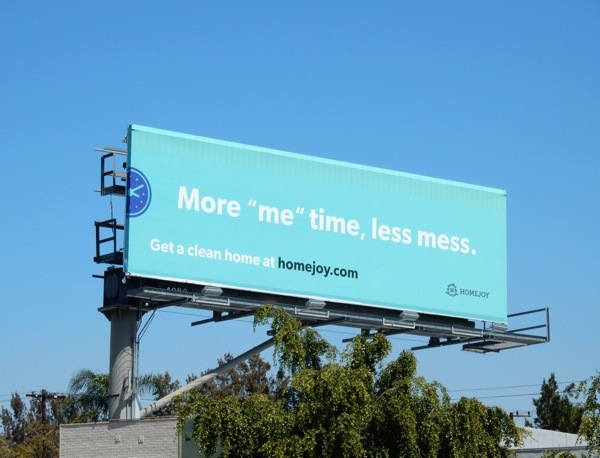 And finally for the BAB Award for the company which primarily used words on their own in the best way, Homejoy did a great job of communicating the benefits of its cleaning service message in a fun, bright and effective way. 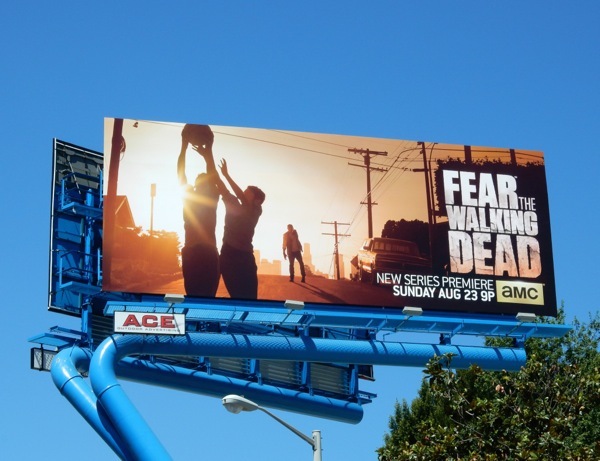 Another campaign which used copy in an effective way, alongside illustrations, were these Move Loot used furniture billboards. 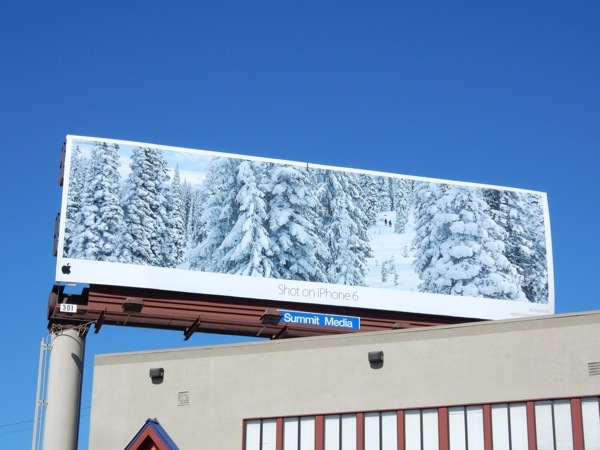 As you can see from this small collection of billboard ads, it's been another busy and creative year in the skies of L.A., full of fantastic ideas, innovative gimmicks and great design work. 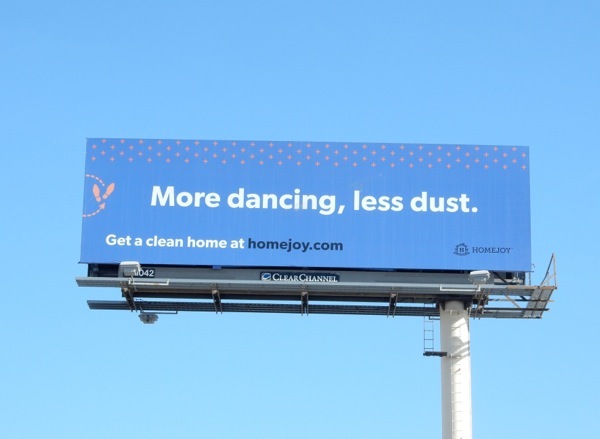 What did you think of 2015's award-winning billboards? Were they some of your agency's work, were they worthy of the honour, or do you think someone else deserved the coveted accolades more? 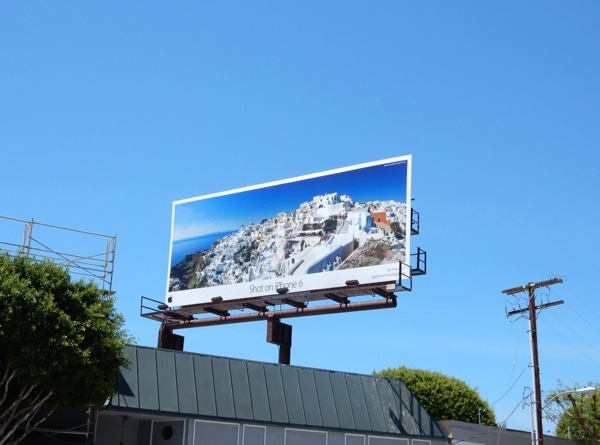 Daily Billboard continues to go from strength-to-strength, and looks forward to another year of photographing and sharing all the out-of-home delights we discover in the coming twelve months. If you like what you see here, be sure to continue to spread the word on social media and by word-of-mouth (as we know you already do), and stay tuned throughout 2016 for hopefully our best year yet.